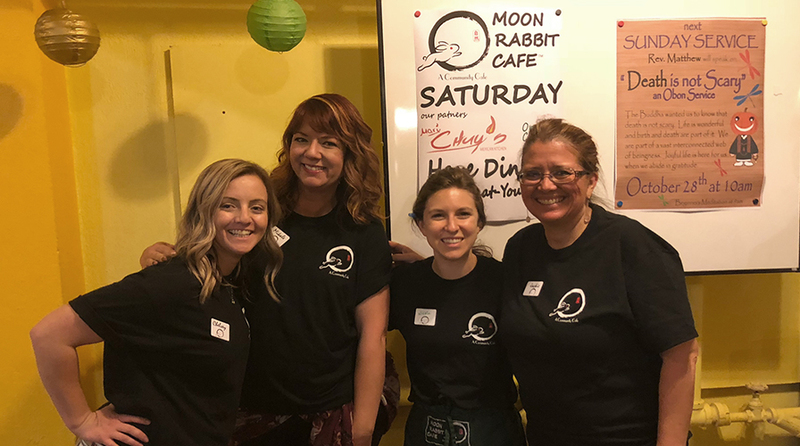 On a recent fall day, four members of team Estipona donned black t-shirts and winning attitudes to help out at the Moon Rabbit Café pay-what-you-can community dinner. We were food and beverage servers for a Latin Harvest meal prepared by Chef Chuy of Chuy's Mexican Kitchen and a merry band of volunteers. The meal featured cornbread, chips and salsa, black bean and chicken tacos and apple crisp. Proceeds from the dinner benefited On Common Ground, whose mission is to connect the community with nutritious food, education and tools that help adults and children grow to their potential. Located in the basement of the Reno Buddhist Center, Moon Rabbit Cafe left us feeling strangely calm and at peace as we worked our hineys off serving hot food to 175 grateful dinner guests.